China’s ranking on Transparency International’s (TI) 2016 Corruption Perception Index (CPI) continues to improve, moving up four places to 79. The latest CPI is a reminder for companies that rely on its rankings to review their global compliance programs and make regional adjustments. Companies should pay attention to those countries and regions that have dropped significantly in the their rankings and scores, and identify compliance risks that were previously undetected. China’s ranking on Transparency International’s (TI) 2016 Corruption Perception Index (CPI) continues to improve, moving up four places to 79. The CPI was originally introduced in 1995 as a composite indicator used to measure perceptions of corruption in the public sector in countries around the world. Since then, it has been used as an important gauge by companies in managing corruption risks when conducting businesses in foreign countries. The 2016 CPI was published January 25, 2017. A country or territory’s score indicates the perceived level of public sector corruption on a scale of 0 (highly corrupt) to 100 (very clean). A country or territory’s rank indicates its position relative to the other countries and territories in the index. TI said this year’s results “highlight the connection between corruption and inequality, which feed off each other to create a vicious circle between corruption, unequal distribution of power in society, and unequal distribution of wealth.” The latest CPI is a reminder for companies that rely on its rankings to review their global compliance programs and make regional adjustments. Companies should pay attention to those countries and regions that have dropped significantly in the their rankings and scores, and identify compliance risks that were previously undetected. More than two-thirds of the 176 countries and territories in this year’s CPI scored below 50 on the index scale of 0 to 100. More countries declined than improved, and a majority of Asia Pacific countries are in the bottom half of the CPI. China’s rank has continued to improve, moving up four places to 79 from 83, and its CPI score increased by three points. Hong Kong also improved, moving up three spots to 15, and its CPI score increasing by two points. In other parts of Asia—Japan, Taiwan, South Korea, Malaysia, India, Indonesia, Thailand, Philippines, and Vietnam—have declined in their rankings. Thailand’s and South Korea’s declines are significant this year. Singapore who saw a decline last year, has improved. Globally, Denmark and New Zealand performed best in 2016. 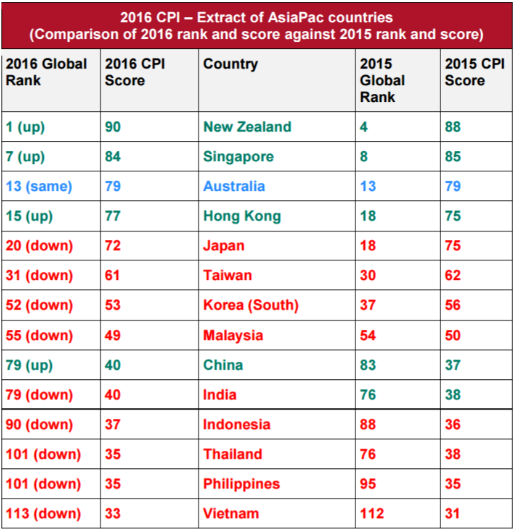 The table below sets out some key jurisdictions in the Asia Pacific showing their 2016 CPI rankings and scores against their standings in 2015. China’s anti-corruption landscape has become more stringent than ever. We have seen active reform in the last 12 to 18 months including the release of new sentencing guidelines for official and commercial bribery offences, the Ninth Amendment to the PRC Criminal Law, new rules on whistleblowing, proposed amendments to the Anti-Unfair Competition Law, a new blacklist system by the State Administration for Industry and Commerce, and new donation rules for the healthcare sector. Companies doing business in China should continue to be vigilant and regularly review their compliance policies and business practices. An effective compliance program and sound compliance culture are key to preventing corporate officers, employees, and third-party agents from engaging in illegal practices such as bribery, collusion, and fraud. Regular and timely compliance training, and a constant review of existing policies in response to the release of new laws and regulations would also improve levels of compliance.